US Lacrosse is now accepting nominations for the Gerald J. Carroll, Jr. Exemplary Coaching Award. The award recognizes outstanding care and guidance, and is awarded annually to one high school boys coach. Nominations will be accepted until Monday, December 6, so head to the US Lacrosse website to nominate your coach! Dom Starsia and Julie Myers have announced their LOI signees for the 2011 – 2012 season. The men’s class is heavy on midfielders and highlighted by Long Island defenseman Greg Danseglio and Baltimore middie Ryan Tucker. The women’s class is led by All-Americans Jessica Loizeaux, Courtney Swan, and Sloan Warren. The first mandatory coaches meeting for the 2011 season will be held on Sunday, December 12th from 4:30-6:00 at ACAC Adventure Central to prepare and discuss the upcoming season. Please bring anyone that you think might be interested in being a first time coach. We always have a need to replace coaches that are leaving the sideline as their child moves up in age group. If you have any questions please email bmsll2011@gmail.com. For more info on BMSLL, click here. On Sunday, November 14, a lunch was held to honor Bob Sandell. Bob is one of Charlottesville’s favorite lacrosse legends. About 120 people gathered at the Albemarle High School cafeteria for some Big Jim’s BarBQ and reminiscing about their experiences with Bob. Bob has done it all in high school and college athletics. He has coached and officiated football, basketball and lacrosse for the past 55 years. Officiating ACC football and basketball along with college lacrosse were his passions. Bob has been inducted in both the local and National Lacrosse Hall of Fames. Bob is responsible for developing a lacrosse officials association in Central Virginia that has sent many of its members to work NCAA tournaments over the past 30 years. Attending Bob’s luncheon were coaches, officials and administrators from Baltimore, Virginia Beach, Richmond, Shenandoah Valley and Central Virginia. 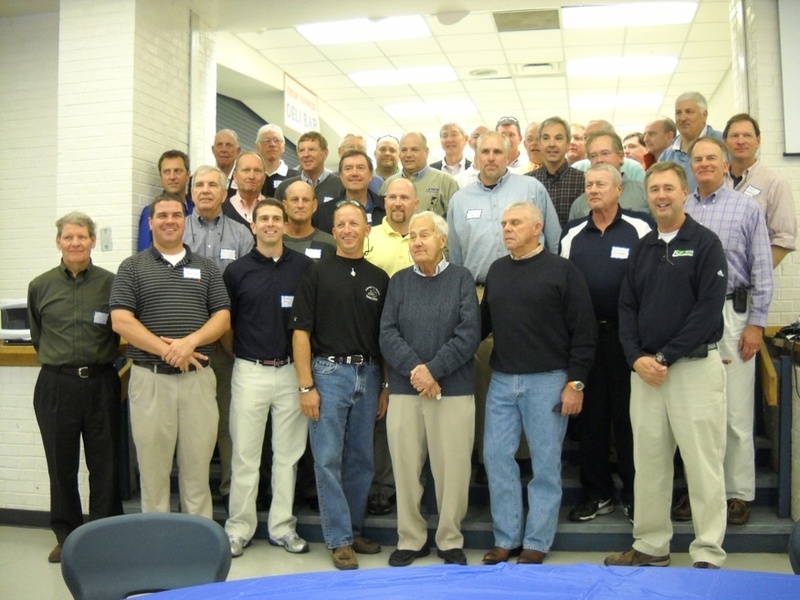 The picture is all of the officials who worked with or for Bob over the years. Thanks Bob for all you’ve done for lacrosse locally and nationally. The US Lacrosse National Convention, presented by Champion®, returns to the Baltimore Convention Center again this January. Billed as “the unofficial start to the lacrosse season,” this event annually gathers the very best the sport has to offer, and provides the sport�? ?s largest educational opportunity, with over 5,000 coaches, officials, program administrators and exhibitors in attendance. Early-bird registration discounts for the Convention end Monday, November 15. To register, head to the US Lacrosse website. US Chapter meeting for Charlottesville and surrounding areas. Meeting will be Sunday November 7th at 6:30pm. The meeting will be located at the Darden School Building on the UVA campus in room 120.